Low inflation is not perceived as a potential threat to determinacy and macroeconomic stability. Should the Fed return to a rules-based monetary policy, the prospect of indeterminacy would be particularly acute if the Fed adopted a mixed policy rule with the nominal interest rate responding to the output gap and output growth. This is true for a rate of inflation as low as that observed on average since the early 1990s. This finding contrasts sharply with the existing literature where the threat of indeterminacy was high before 1983 and almost nonexistent afterwards. Key to our result is a strong interaction between low trend in ation, sticky wages and technological trend growth. Accounting for a cost channel of monetary policy and a roundabout production process increases the threat of indeterminacy under low inflation. When removing the output gap or output growth from the mixed rule, we find that a rule responding to output growth sharply widens the scope for stability. By stark contrast, the results obtained under a rule reacting to the output gap only essentially mimic those with the mixed rule. Keywords Low trend inflation, Taylor rule, Output gap, Output growth, Indeterminacy, Sticky wages, Trend growth, Working capital, Roundabout production. Khan, H.U, Phaneuf, Louis, & Victor, Jean Gardy. (2018). 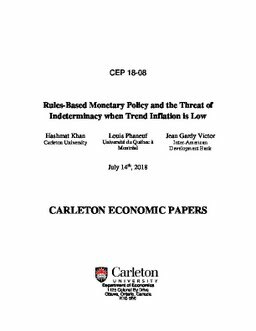 Rules-Based Monetary Policy and the Threat of Indeterminacy When Trend Inflation Is Low (No. CEP 18-08). Carleton Economic Papers (CEP). Department of Economics.